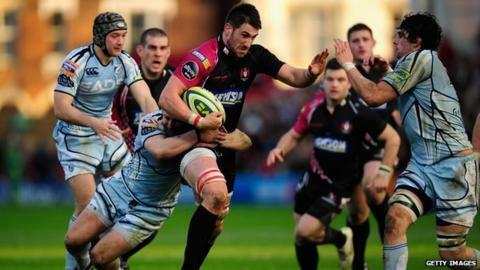 Gloucester flanker Matt Cox has committed to a new two-year deal with the Premiership side. The 23-year-old arrived from Worcester in the summer of 2010 and has since made 21 appearances but only managed a full 80 minutes in six of those games. "I'm happy to be re-signing," the former England U20s and England Sevens international told BBC Gloucestershire. "It's great news that they've shown faith in me and they have me in their plans for the future." The back-row forward added: "I've had a few quiet weeks and been in and out of the side. "I want to play week-in week-out and with a side like Gloucester you've got full internationals and rugby legends in the back row. "For an impatient 23-year-old it gets a bit frustrating but the good thing about working with Hoggy [Carl Hogg, coach] is that he gives me a schedule and what I'm going to be doing. "Hopefully in the next couple of seasons I can get more integrated."